Orions are an aggressive human-looking race that originated on Rigel VIII. also known to the United Federation of Planets as Orion. Males are yellow-skinned and trained as warriors. 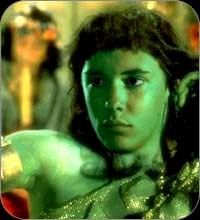 Females are green-skinned. very sensual and aggressive. often trained as dancers. Orion was given interstellar technology by early explorers from Earth. and used the technology to colonize two planets circling one of Rigel's adjacent stars. They formed a pirate empire. and traded extensively in Orion slave-girls until the Federation abolished slave trade. The Rigel system strangely unique. It is a quadruple star system. that contains 13 planets -6 of which are inhabited. Two of the inhabited planets have been colonized by humans, a third contains what is believed to be a peaceful offshoot of the Vulcan race. The fourth and fifth inhabited planets are locked in a trojan orbit. revolving around each other. One of those planets is the home of native primitives, the Kalar, and is avoided because of their primitive. hostile and solitary nature. The other functions as the trade hub of the Rigel system. The last is Orion. There is also an uninhabited planet in the system that is rich in dilithium. and is continually mined to help supply the Federation with the needed element. For many years Orion males have operated as pirates in remote areas of Federation Space. This practice continues, though somewhat diminished. to this day. During their heyday, Orions also became quite wealthy trading Orion females. trained as alluring dancers. as slaves. Though the slave trade has been largely stopped by the Federation slaves are still sometimes traded. mainly with civilizations not apart of the Federation, such as the Ferengi. Cardassians. and Klingons. The Orins (as they are known in the Kilb-iverse) were a race of opportunists that enslaved and sold off the women of their own race to further their place in the galaxy. It is not uncommon to see Orin women serving in Imperial 'relaxation spas' for Imperial officers during the height of the Empire. It should be noted that while the Empire most certainly took the women as 'socialators' to help 'ease' the suffering of the Imperial officers on long voyages, but the male Orins didn't fair any better as they were large enslaved for menial labor. After the Republic defeated the Empire the Orin race went back to selling off it's women in an attempt to get ahead socially and as a result the Republic has asked them to stop after they became members of the senate. The Orins did to a degree, they just stopped selling the women in Republic space.